Extracting emails from files is probably something that the majority of computer users never need to do. It refers to parsing files to identify email addresses and make those addresses available after the parsing so that they can be used in programs or applications. It can however be interesting to some users who have them stored in a database with all kinds of information and want to extract all emails to mail every user in that database. It can be used as a way to collect addresses to spam Internet users as well but I'm not advocating this as I hate spam just like everyone else on this planet. But, if you happen to have a plain text file that contains a number of email addresses, then you may find it useful to use a software program to extract those email addresses. This can be useful to add them all to a mailing list for instance, without having to copy those mail addresses manually which would take a long time. The software Email Address Extract works surprisingly well. All you need to do is point it to a folder on your hard drive and select the file type that you want to be crawled. Some preconfigured files types are htm, log and dat but it is possible to use wildcards or other file types as well. The option to process sub-folders automatically is available as well here. The scan itself does not take longer than a few seconds normally. I did test it on one of my mailbox files in Thunderbird and it did extract more than 6000 emails from it which means it works with with all files that contain text. Doubt it will be highly successful crawling binary files though. Emails that have been found can be exported into a text document for further processing. They can be sorted by username or mails server before doing so. Update: the program has not been updated for a while and it is not compatible with 64-bit editions of the Windows operating system. The program homepage lists Windows NT as the last compatible operating system, and while you may still be able to run it on later versions of Windows, you may run into issues doing so. 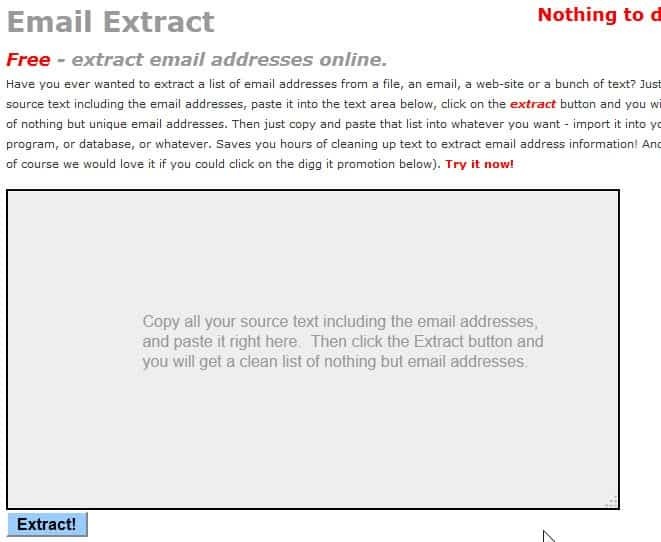 An alternative that you may want to use is Email Extract, an online service that you can use to extract emails from text that you paste into the online form. It has its issues as well obviously. First, it is an online service which means that whoever operates it gets at least theoretical access to the emails as well.